Effect of maternal oral ingestion of Aspirin on birth weight of wistar rat offspring. Thomas MA1, Amosu AM2*, Degun AM3 , Oyegbile O1 and Ramakuela N4. 2Department of Public Health, School of Health Sciences, University of Venda, Thohoyandou, 0950, South Africa. 4Department of Advanced Nursing Science, School of Health Sciences, University of Venda, Thohoyandou, 0950, South Africa. This study was carried out to examine the influence of maternal oral ingestion of aspirin on the birth weight of off springs in Wistar rats. The experiment was performed with 30 rats consisting of 24 females and 6 males of body weights ranging between 200g and 250grams. The 6 males were separated from the 24 females; which were then divided into 2 groups of 12 each, A and B respectively. Nine female rats were then removed from each group to form classes A and B, while the remaining 6 females formed the control class C. Each was then placed in an enclosure for 2 days with a male after which they were examined for signs of copulation. 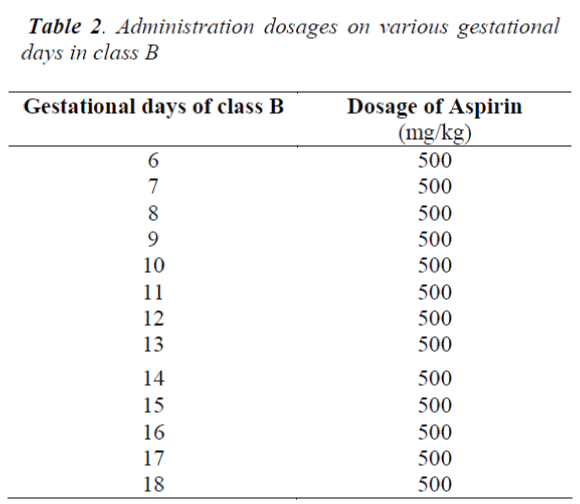 Water containing soluble aspirin in varying doses was then administered to the rats in classes A and B on the various gestational days. Off springs of the animals were weighed and their weights recorded. A decrease in offspring birth weights was recorded to be more in class B, receiving higher doses of aspirin, compared to class A. The birth weights of the newborns in the control group were observed to be within the normal range of 5 to 6grams for Wistar rats. Maternal ingestion of aspirin led to the production of off springs with low birth weight, the severity depending on the dosage of aspirin administered. Aspirin, Wistar rats, gestational days, newborn, birth weight. A wide range of different chemicals and environmental factors are suspected or are known to have negative effects on pregnancy in humans and animals. A selected few include social drugs, prescription and nonprescription products. Nicotine (Tobacco), Caffeine, Ethanol (Alcohol), Isotretinoin (13-cis-retinoic acid, Roaccutane), Tetracycline, Thalidomide, Trimethadione, Progestin, Retinol (Vitamin A), Vitamin D and Aspirin have also been implicated. The easy accessibility of aspirin as an over-the-counter (OTC) drug to the general public, its cheapness/ popularity makes it potentially dangerous as a teratogen if administered to the gestating/ mothers, posing a potential risk to the developing foetus. Aspirin is used for the treatment of a number of conditions including fever, pain, rheumatic fever, and inflammatory diseases, such as rheumatoid arthritis, pericarditis, and Kawasaki disease. It is used in the prevention of transient ischemic attacks, strokes, heart attacks, pregnancy loss, and cancer . It has however, been suspected to cause anomalies such as ventricular septal defects and possible neural tube defects . It was first isolated by Felix Hoffmann, a chemist with the German company Bayer, under the direction of Arthur Eichengrün . Salicylic acid, the main metabolite of aspirin, is an integral part of human and animal metabolism. While in humans, much of it is attributable to diet and a substantial part is synthesized endogenously . The main undesirable side effects of orally ingested aspirin especially in higher doses are gastrointestinal ulcers, gastric haemorrhage and tinnitus. In children and adolescents, aspirin is no longer indicated to control flulike symptoms or the symptoms of chickenpox or other viral illnesses, because of the risk of Reye's syndrome . Today, aspirin is one of the most widely used medications in the world, with an estimated 40,000 tonnes of it being consumed each year . Generally, most pregnant women especially in rural areas take medicines including aspirin, based on their basic knowledge picked up from different places or being treated by quack doctors. Aspirin is usually given to relieve pain even during pregnancy and this may result in various birth defects depending on the doses given and the period of pregnancy in which it was administered. Chronic high dosage exposure of pregnant women to aspirin has been associated with low birth weight, and a variety of maternal and placental complications . Birth weight refers to the total mass of newly born species at birth and it can either be low, high or normal depending on the prevailing situations in the gestational period. Low birth weight (LBW) in humans has been defined by the World Health Organisation as birth weight of a live born infant of less than 2,500 grams regardless of gestational age . It is closely associated with foetal and peri-natal mortality and morbidity, growth retardation and cognitive development, and chronic diseases such as an increased risk of developing Type 2 Diabetes in later life . Some studies have however, shown a direct link between increased birth weight and an increased intelligence quotient . At the population level, the proportion of babies with LBW is an indicator of multifaceted public health problems that include long-term maternal malnutrition, ill health, and inadequate health care during pregnancy. LBW is an important predictor of newborn health and survival, and is associated with higher risk of infant and childhood mortality [10,11]. The normal birth weight for a Wistar rat is between 5-6 grams. Birth weight of less than 5grams can therefore be regarded as low birth weight in Wistar rats. This study; which was conducted in Bowen University, Iwo, Osun state, Nigeria, in 2013, was carried out to ascertain the effect of maternal ingestion of aspirin on the outcome of pregnancy in Wistar rats, with special reference to newborn birth weight. Food pellets, fresh clean water, oropharyngeal cannula, water bath, thermometer, marker, gloves, industrial cages consisting of feeding and water apparatus, soluble aspirin tablets and sensitive weighing scale. This body weight range was chosen to ensure that the rats were mature enough for the experiment. The animals were provided food and water ad libitum while their cages were regularly cleaned out. The use of Wistar rats, as experimental animals, for this study was approved by the Joint College of Health Sciences/Bowen University Ethics Committee and the stipulated Principles and Guidelines for the use of Animals in Research followed. ■ Twenty four female rats were divided into 2 groups, A and B, consisting of 12 rats each. ■ Group A rats were placed in a darkened enclosure with 6 males for about 1 hour, with a barrier preventing physical contact between the opposite sexes, for acclimatization. ■ The female rats in group A were then divided into 6 sets of 2 each and each set placed with one male rat. ■ The sets were then placed in an enclosed space for 2 days with the males after which they were examined and confirmed to have copulated. ■ The first day of copulation was termed gestation day 1 and the following days numbered accordingly. 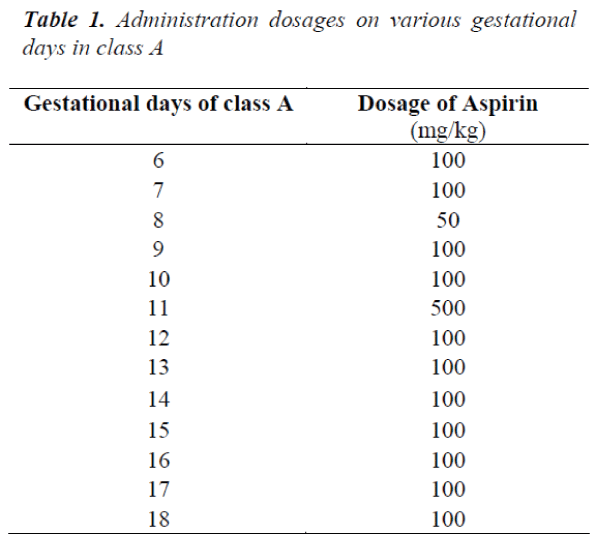 ■ The A and B classes of rats were then administered various doses of aspirin on the various gestational days shown in the Tables 1 and 2, respectively. The drugs were administered after prolonged thirst through an oropharyngeal cannula. The rats were carefully handled to restrict movements and prevent being traumatised during administration. ■ The control group rats were not given any aspirin solution. It was observed that the birth weights of the offsprings decreased significantly in Class B and slightly in Class A while the birth weights of the offspring in the control groups ranged between 5 and 6 grams; which is the normal birth weight for Wistar rats. Doses of aspirin ingested affected the birth weights in both groups but the effect was more pronounced in the newborns of the mothers; which received higher doses of aspirin. The birth weights of the newborns in the control group were observed to be within the normal range of 5 to 6grams for Wistar rats. The study was carried out to determine the effect of maternal ingestion of aspirin on birth weights of wistar rats’ off-springs. The findings revealed that low birth weight was recorded in Class A, with maternal administration of a minimum level of aspirin dosage right from conception, while in Class B there was very significant low birth weight recorded as a result of chronic high maternal administration of aspirin. This result is in line with an earlier finding in which it was observed that high dosage exposure to aspirin during pregnancy was associated with low birth weight and a variety of maternal and placental complications . High doses of aspirin are known to be teratogenic in rats, causing facial clefts and cranial and neural tube defects. Several large studies have not found an increased incidence of congenital abnormalities in humans associated with high dose aspirin. In a review of case reports of 103 women who took more than 3g of aspirin per day for rheumatoid arthritis during the last 6 months of pregnancy, no fetal or neonatal effects were reported. However, there was evidence of prolonged spontaneous labour, increased frequency of premature labour and longer gestations. Mothers taking normal doses of aspirin over prolonged periods during pregnancy have low birth weight babies . In a retrospective, controlled study, an association was observed between aspirin ingestion in the first trimester of pregnancy and cleft palate/lip involving 599 children. The incidence of combined cleft lip and palate was 19.8%, nearly 4 times the rate in the control group. However, the significance of these findings is unclear as retrospective reporting is more likely to show a tendency towards malformations even when compared to a control group . Also, in a meta-analysis of six published controlled trials (one nonrandomised, two non-placebos, three double-blind) of aspirin in pregnancy-induced hypertension (PIH), the researchers evaluated the degree of reduction in the incidence of PIH, the reduction in severe low birth weight infants, and adverse effects of low doses of aspirin during pregnancy. Of 394 women studied the relative risk of pregnancy-induced hypertension in women who took aspirin was found to be 0.35 (95% CI; 0.22-0.55) . Aspirin has been around for over a century and even today it appears to be frequently taken in pregnancy as a mild analgesic, usually without a prescription. Teratogens have negative effects on the developing embryo in both animals and human beings and the adverse effects can manifest at both prenatal and postnatal stages of development. Though direct conclusive evidence of adverse effects in humans is still being investigated, the ingestion of aspirin by pregnant women may portend a potential hazard to the unborn baby. The indiscriminate use of the drug, aspirin, during pregnancy is therefore contraindicated. The use of aspirin in the first trimester of pregnancy should however, be avoided as much as possible, except in cases of extreme emergencies. This is more so as LBW may have long-term detrimental effects later in life for those that survive. Algra, A.M & Rothwell P.M. Effects of regular aspirin on long-term cancer incidence and metastasis: a systematic comparison of evidence from observational studies versus randomised trials. The Lancet Oncology 2012; 13: 518-27. Paterson JR; Baxter G; Dreyer JS; Halket JM; Flynn R & Lawrence JR. Salicylic Acid sans Aspirin in Animals and Man: Persistence in fasting and Biosynthesis from Benzoic Acid. Journal of Agriculture and Food Chemistry 2008; 56: 11648–52. Sneader W. The discovery of aspirin: A reappraisal. British Medical Journal (Clinical research Ed) 2000; 321:1591-4. Warner TD & Mitchell JA. Cyclooxygenase-3 (COX- 3): filling in the gaps toward a COX continuum? Proceedings of National Academy of Science 2002; USA 99: 13371–3. Brent R & Beckman D. Environmental Teratogens. Bulletin of the New York Academy of Medicine 1990; 66: 123-161. PMC 1809745. Kramer MS. Determinants of LBW, Methodological assessment and Meta analysis. Bull. WHO 1987; 65:663-737. Gillman MW, Rifas-Shiman S, Berkey CS, Field AE & Colditz GA. Maternal gestational diabetes, birth weight, and adolescent obesity. Pediatrics 2003; 111: 221–6. Matte TD; Brenham M; Begg MD & Susser E. Influence of variation in Birth Weight within normal range and within sib ships on IQ at age 7 years: cohort study. British Medical Journal 2001; 323: 310–4. Susser M; Marolla FA & Fleis J. Birth weight, foetal age and perinatal mortality. American Journal of Epidemiology 1972; 96, 197-204. Miller HC. Foetal growth and neonatal mortality. Paediatrics 1972; 49:392-9. Lewis RB & Schulman JD. Influence of acetylsalicylic acid, an inhibitor of prostaglandin synthesis, on the duration of human gestation and labour. Lancet 1973; (ii): 1159-61. Imperiale TF & Petrulis AS. Aspirin and non-steroidal anti-inflammatory agents in pregnancy. Journal of American Medical Association 1991; 266: 261-65.